Naruto Saga is the second free-to-play Naruto MMORPG from IceGames, after Ultimate Naruto. 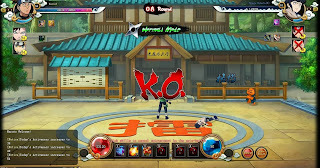 Naruto Saga is an isometric MMORPG with turn-based battles in the style of King of Fighters. Players have to choose one of three classes, Taijutsu, Ninjutsu and Genjutsu, and enter an exciting adventure with battles that require all their skills as well as speed to execute the QTE. Battles are fast-paced and with some astonishing visual effects.